Tax | Something should go here, maybe later. Thought this old post from Kiwiblog spoke to some recent events. One of the frustrating things about trying to have a sensible debate about the correct level of taxation in this country, is that whenever an MP talks about reducing the tax burden, left wing MPs allege their only motivation is self interest and play on the politics of envy by saying they are only promoting it so they will get x dollars more a week themselves. It is rather absurd to see them try this against Don Brash yesterday, alleging he supported tax cuts so he would get $168 more a week himself. Hello – this is the man who took a pay cut of around $500,000 a year to become an MP. I really don’t think he did it to try and then claw back $168 a week in exchange. It was silly then and it’s silly now. ZenTiger repeats the old story of the 10 men at the restaurant. It’s a good story to illustrate the way we talk about tax. But I was thinking the other day, that it could be improved by the addition of some actual illustrations – graphs. The first four men paid nothing at all. They ate for free. The fifth man paid $1.00; the sixth paid $3.00; the seventh paid $7.00; the eighth paid $12.00; the ninth paid $18.00. And the tenth man, who was by far the richest of them, paid exactly $59.00, which was most of the $100.00 bill. He didn’t mind, however, since he could afford to pay that amount. All was well. The ten men were happy with this arrangement, and they continued to eat at the restaurant every single day, enjoying their time together. From that chart, you can see exactly how most of the food is being paid for by the richest man – something that happens in progressive tax systems all over the world. The men were pleased. But the situation did present a problem. How were they to divvy up the savings among them? Obviously, they could not simply credit $2.00 (one-tenth of the $20.00 savings) to each of the ten men, since that would mean that the first four men would actually be getting paid $2.00 to eat! No good. It only seemed fair that the first four men, who paid nothing to begin with, should likewise not get any of this $20.00 refund. But still, there was a problem. If they now divided the $20.00 savings among the remaining six men, that would be $3.33 per man. If that amount were subtracted from each man’s payment, then the fifth man and sixth man, who had been paying $1.00 and $3.00 respectively, would then be getting paid to eat. That wouldn’t work, either. No, the solution to this problem required some ingenuity. Just then, the restaurant owner, who had been listening to the discussion, interrupted. He offered a solution. He suggested that the fairest way to settle this dilemma would be to reduce each man’s bill by the same proportion as he had been paying in the first place. The owner walked over to his calculator and figured out the amounts each man should pay. And so it was agreed. The fifth man, instead of paying $1.00, now paid nothing, just like the first four men had always done. The sixth man paid $2.00 (reduced from $3.00); the seventh paid $5.00 (reduced from $7.00); the eighth paid $9.00 (reduced from $12.00); the ninth paid $12.00 (reduced from $18.00). This left the tenth man with a bill of $52.00, instead of his previous bill of $59.00. The men paid their bill according to this arrangement, and they left the restaurant, satisfied. So the bill looks the same, but with everyone getting a cut. The 5th man now gets his small bill reduced to zero. The nine men surrounded the tenth. Their anger mounted as they continued to express their resentment at what they thought was a supreme injustice. Finally, they lost control of their senses. They beat up the tenth man. They left him bloody in the street, and they went home. They’re right – most of the price reduction went to the 10th man and 9th man. But notice that it’s a pie graph, talking about differences in the old and new proportions rather than the proportions themselves? The next day, the tenth man did not show up for their regular dinner. The nine men sat down and ate without him. But when it came time to pay the bill, they discovered something: they were $52.00 short! Needless to say, that was the last time those men ever ate at that restaurant. I wish I could say that these nine men learned a valuable lesson, that they came to understand the principle upon which a tax cut is based. But they didn’t. They were too stupid to understand. Here’s the graphs that they missed. Proportion of the old bill to each man. Proportion of the new bill to each man. See that? The 10th man is actually paying a larger percentage of the bill with the new arrangement! but most importantly, it talks about a proportional cut to a proportional system in non-proportional terms. By phrasing tax cuts in these terms, Labour and the left force more and more burden onto the richest man. They also demonize him as getting “more money” when taxes are cut across the board. As the story illustrates, that’s very dangerous. It runs the sever risk that those being attacked will quite rationally decide that paying so much money to be the whipping-boy of society is stupid, and they will leave. When that happens, we all end up worse off. Now, I’m not saying here that we should give the rich a small tax burden. I’m simply saying that we should stop looking for ways to bash them, and start acknowledging that the vast majority of us are getting far more from the government than we pay in taxes, and we are bashing the people who make that possible. How much tax do familes really pay? The other day, DPF posted this chart. 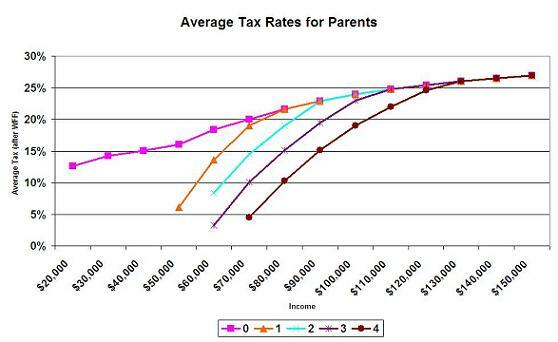 If you have even just one child you do not pay any income tax until you are earning $42,000! And you keep receiving WFF until you earn $74,000. With two kids, then your family pays no income tax $50,000 of income. And you receive WFF until you earn $89,000. If kid number three turns up, then you pay no tax until $56,000 and you receive WFF payments until you income exceeds $105,500. 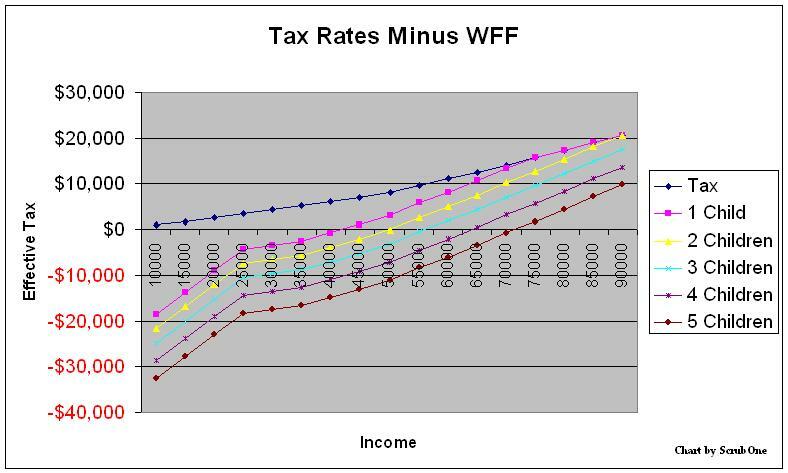 It made me wonder, exactly how do the effective tax rates look when you figure in WFF? How deeply negative do the figure go? Who first signed up to cutting the top rate? Well, I would make the case that Labour was the party that first agreed to cut the top tax rate. they will conduct a review of the current business taxation regimes with the view of ensuring the system works to give better incentives for productivity gains and improved competitiveness with Australia. This is political speak for “we’ll reduce the business tax rates to match Australia”. Both Labour and United Future knew full well that this would end up bringing down the top personal tax rates too. I know this because I heard it explained as such by a United Future MP. You simply can’t have company rates lower than personal rates, because it opens a loophole for people to decrease their tax liability. Had Labour been in power this term, there can be little doubt that they would be doing the same as National. Lucky for them, they’re not so they can now oppose the change that they started. All this fuss about “tax cuts for the rich, paid for by the poor” ignores some basic facts of life. First, tax cuts aren’t handing out money. Homepaddock covered this one nicely. Second, while making a massive fuss about how the “poor” get hammered by this and that (much of which I have smypathy for – I was unimpressed with the idea to raise GST) the left forget the flip side of the coin – what the rich can do. In our case, individuals move out of the country completely, or move their income to companies or trusts. By reducing the top tax rates, compliance becomes less profitable, and this means less money spent hiding income, and more spend productivity. Also (and I keep forgetting to say this) tomorrow is the last day of the tax year. But, if you were to give your April donation tomorrow, you then get your 1/3 tax rebate back in a couple of weeks, rather than next April. I have a similar announcement to make… October-ish. Someone remind me, I never got around to it last year. DPF’s post on GST and inflation reminded me of this photo I took early 2008. I usually buy the generic brand (they do all come from the same factory after all) and that’s currently around the $9 mark. I do think however that raising GST is absolutely, unequivocally, stupid. It gives the “National Hates The Poor” crowd a big, fat platformto stand on, and with all the tinkering that’s going to be put in to make sure that it doesn’t affect those on low incomes you might as well have just left it alone in the first place. My preference is to cut out Labour’s more blatant “we’ve lots of money and want to return to power” bribes like Working for Families and interest free student loans and use that money to cut GST altogether. That would lead to a massive decrease in bureaucracy in both government and business. Update: Well. 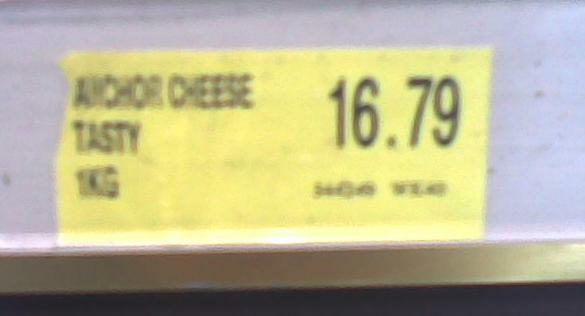 Back at the supermarket today and cheese had shot up by $2! In fact I think Anchor is only just below the price there. We paid almost as much for 700g today as we did last week for 1kg. DRJ posts at Patterico that Maryland has had a massive decrease in millionaires. Now, partly this is the recession. But the fact that they raised taxes on people who can easily afford to move doesn’t appear to have helped. Y’know, isn’t it the left that’s always going on about how poor people get affected by this and that – yet they can’t work out that the rich won’t be affected by any given measure if they really don’t want to be. Here they said that taxing those over $60,000 would fix health. They must have a different definition of “fixed” to the rest of us. One year later, nobody’s grinning. One-third of the millionaires have disappeared from Maryland tax rolls. In 2008 roughly 3,000 million-dollar income tax returns were filed by the end of April. This year there were 2,000, which the state comptroller’s office concedes is a “substantial decline.” On those missing returns, the government collects 6.25% of nothing. Instead of the state coffers gaining the extra $106 million the politicians predicted, millionaires paid $100 million less in taxes than they did last year — even at higher rates. Taxes change behaviour, this is so well know it’s not funny. Yet people seem to think they can crank things up “just a little more”. So the whole thing backfires, and the middle classes end up holding the baby. Bizarre. Why can’t the government just let people make their own mistakes and leave it at that? The Australian Food and Grocery Council, and now the federal opposition, have attacked the Rudd government’s preventive health taskforce, challenging its credibility over fat taxes and claiming Vegemite could be forced off the shelves because it is too salty. Speaking in Brisbane on Wednesday, Mr Dutton said a fat tax on Vegemite would be ludicrous. “We are calling on the Labor government to rule out this absurdity, to make sure that Australian families won’t have to pay a tax on Vegemite,” he said. “They don’t need to be served up a menu from the Rudd government about what they need to eat and drink three meals a day. There are times when the Maori Party will have to choose between backing the interests of the Maori working class or the interests of the Maori business elite. A common Maori identity is no use when one side wants a pay rise and the other wants to keep its profits; when one side wants a top-bracket tax cut and the other wants better public health and education. As if a top-bracket tax cut better public health and education are in conflict! Cuts to the top tax bracket can often lead to higher tax takes, as they encourage people to declare their full income and to not move away and pay tax in other places. Higher tax takes mean more money to spend on public health and education. Of course, more money doesn’t necessarily lead to better outcomes – Labour proved that. Do these people even wonder why no one has raised tax on smokes recently?